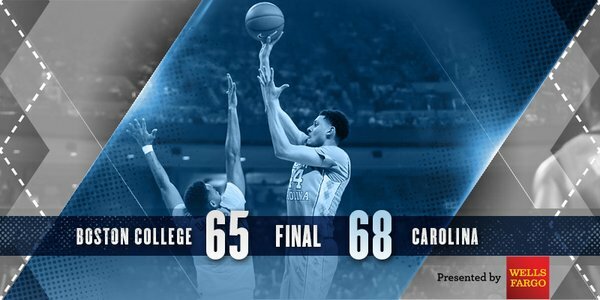 The Tar Heels Played most of the second half without head coach Roy Williams, who left the bench after complaining of dizziness. The 65-year-old, it is being reported suffered from vertigo in the past. He left the bench for the locker room, escorted by trainer Doug Halverson and game staff members and the coaching duty was taken over by assistant Steve Robinson for the remainder of the contest. Jackson, who is averaging 11.7 points per game, stepped up on Tuesday to shoot 9-of-11 from the floor and made two of his three 3-point attempts for the Tar Heels (20-4, 9-2 Atlantic Coast Conference), who rebounded from the defeats to Louisville and Notre Dame last week. The sophomore forward was scoring his fourth 20-plus point game this season. Marcus Paige hit three 3-pointers, including one that gave North Carolina a 62-60 lead with 1:47 remaining, on his way to scoring 12 points. Joel Berry II added 10 points, six assists and two steals for North Carolina, which shot 50.9 percent from the floor. Eli Carter scored a game-high 26 points and dished out four assists to lead the way for Boston College, missed a half-court 3-point attempt that would have tied the game as time expired. Dennis Clifford added a double-double of 14 points and 13 rebounds for the Eagles (7-17, 0-11 ACC), who remain winless in ACC league play this season. Boston College led 37-31 at halftime and held the advantage until Theo Pinson made a pair of free throws to give UNC a 57-56 lead with 3:55 remaining. Carter made a 3-pointer for the Eagles to regain the lead with 2:01 left, but it didn’t last long as Paige buried one of his long-range shots to put North Carolina back on top. The Tar Heels, who lead the ACC standings, will face Pittsburgh in their next fixture on Sunday, with Boston College taking on Syracuse over the weekend as well.